On February 1, 2018, Andrew Lees spoke at the Keystone meeting, Emerging Technologies in Vaccine Discovery and Development, held in Banff, Alberta, Canada. He chaired the session, “New Tools in Vaccine Manufacturing and Product Analytics”. During the session, Dr. Lees discussed the challenges of manufacturing highly multivalent vaccines and working with conjugation chemistry. He also outlined the development of “EcoCRMTM”– FinaBio’s low cost CRM197 conjugate vaccine carrier protein. The seminar emphasized why value pricing is an inappropriate model for required vaccines. Value pricing is based on money saved and is often used to justify high prices for drugs. A better model for vaccines that every child on the planet should get is “cost plus”, where the price is set to give the manufacturer a fair but not outrageous profit. Andrew Lees also presented a poster on EcoCRMTM as a vaccine carrier protein. The poster presented immune data from conjugates made with Pfs25, a malaria transmission blocking protein and with an HIV glycopeptide. 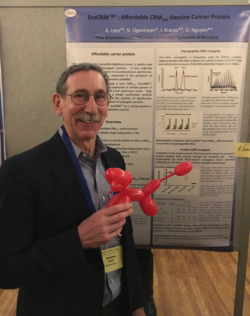 To liven up the evening, Andrew also exhibited his skill as an animal balloon artist. Also presented at the Keystone meeting was a poster from collaborator Dr. Marco Pravetoni titled, “Development of Therapeutic Vaccines for Treatment of Opiod Abuse”. The work demonstrated that derivatives of opioids conjugated to two FinaBio carrier proteins, EcoCRMTM and recombinant tetanus toxin heavy chain fragment C (rTTHc), induced better immune response than conjugates made with KLH. Rats immunized with EcoCRMTM and rTTHc conjugates were also superior to KLH conjugates at reducing self-administration of opioids. In addition, the CRM197 and rTTHc conjugates could be easily characterized by mass spec, unlike KLH.